It seems the selection of good quality/well designed knits has been growing by leaps and bounds lately. 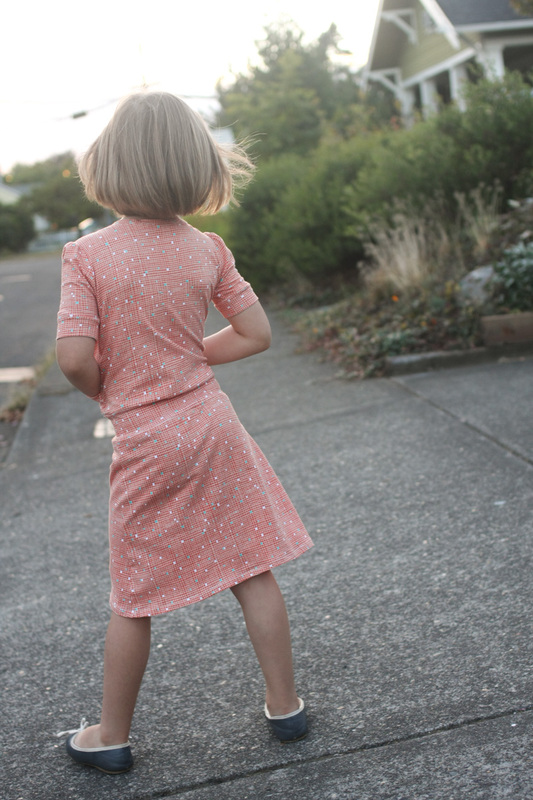 Especially at Art Gallery – I’ve wanted to try one of theirs for awhile now, and my opportunity arrived when Toni of Make it Perfect asked if I’d like to sew up her new pattern, the Joey Dress. 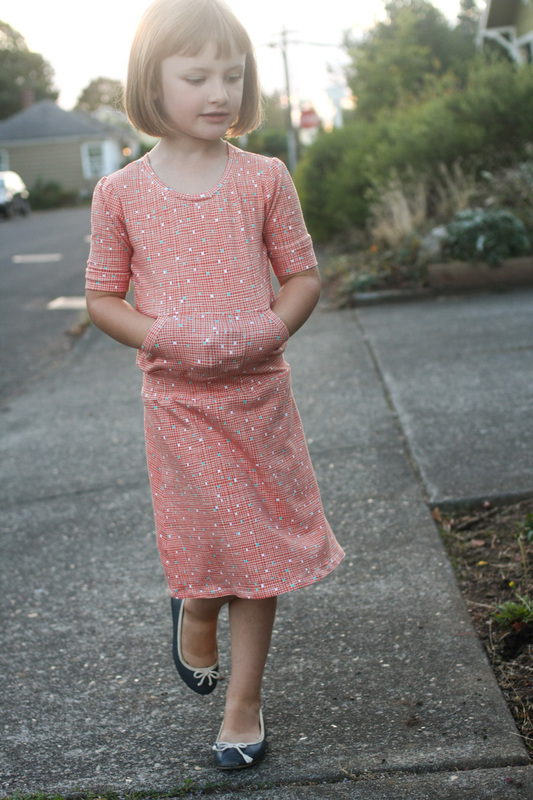 I love the style and knew Lila would be into a comfy dress like this. This print is called Threaded Shreds Mamey from Katarina Roccella’s Indelible line, which includes several knits (this one is really cool, too). The fabric is so super soft, and has 5% Lycra for a nice stretch. I’d hoped to use a solid for the bindings (like Kristin’s – so cute), but I couldn’t find a good match (coordinating solid knits, please, Art Gallery!) so I used the print for everything. You can definitely go either way with this pattern – I especially love Toni’s solid blue version. My main complaint about knits is that my finished product is never quite up to my quality standards. Each one acts a little differently depending on its makeup, and while I’ve tried every sewing-with-knits tip known to man, I still haven’t cracked the code. Because of that there are some problems with this dress, but nothing too tragic – I think I stretched the neckband a little too much, and a few of the seams are a little wavy. I love the dress though, I mean I really love it. How it feels, how it looks, how it fits, the sleeves, the pocket, everything. Well, everything except the fact that she looks so grown up in it. Five going on 15. I live in fear of things coming out too short, so after reading Sanae’s Big Joey post, I added 1.5 inches to the size 5, just to be on the safe side. I hemmed it before she tried it on, and it’s too long – I think I prefer it just above the knee like Toni’s. 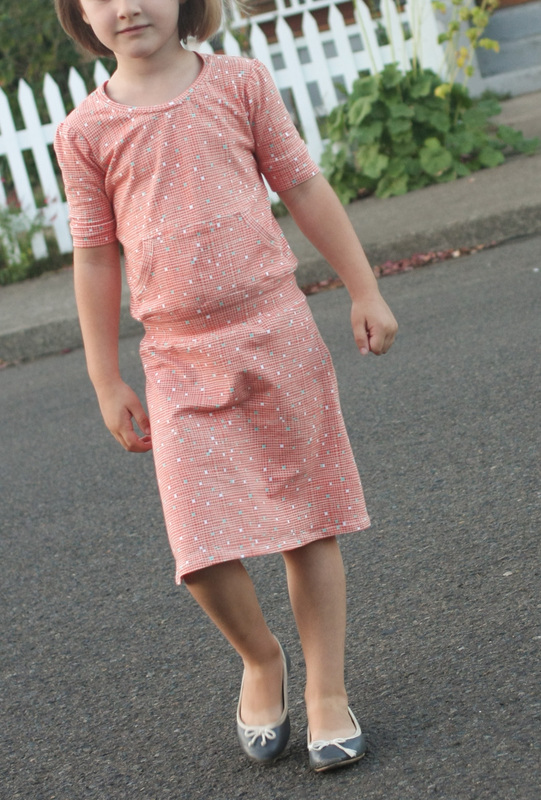 Maybe I’ll hem it up another inch or so, or maybe I’ll leave it alone and she can wear it until she’s seven. I’m even semi-happy with how the hem came out – I used twin needles for the first time and it really did help to combat the waves. Anyway, yet another great Make it Perfect pattern – I want to make a bunch of Joeys! Thanks to Toni for the pattern and to Linh for the beautiful knit! Good stuff, all around. 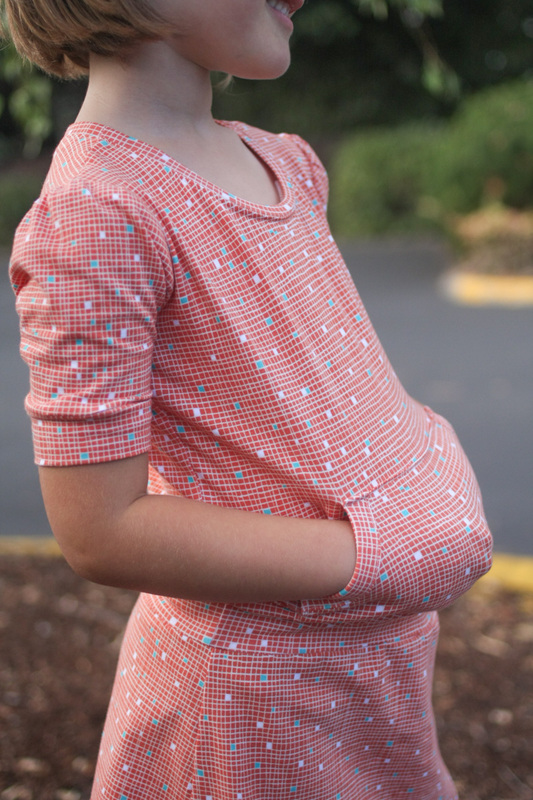 NEWS FLASH :: Toni just announced that Make it Perfect PDF patterns are 50% off for two days! So pretty and lovely pics. 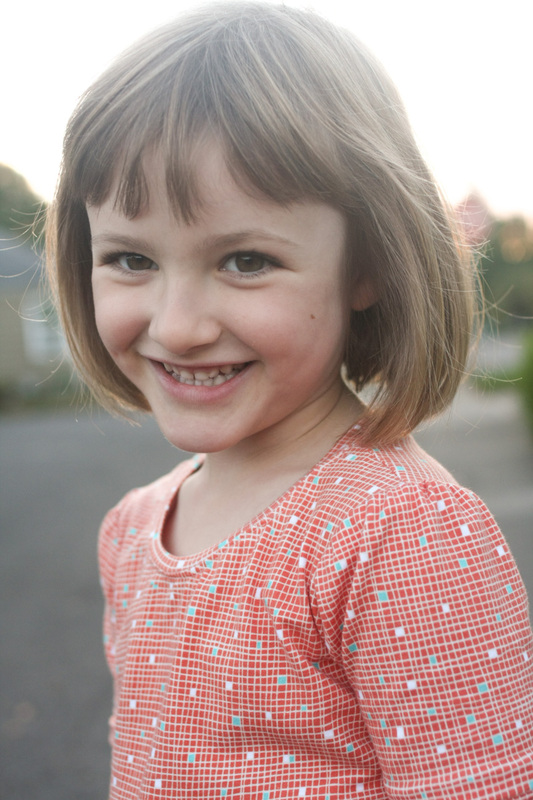 Lila does look grown up! I’d like to leave a comment, but I’m laying on the floor in shock from how grown-up she looks in this dress. So cute! You did a great job! She really does look grown up in it. Plus, am I the only one that really wants one of these in my size?! Black knit maybe…. Aaaaadorable. I already told you that, though, hehe. It looks great and doesn’t seem too long to me – I usually err a bit long though too, more growing room. I love it! The dress is so adorable! I love that color on her. It looks great – no signs of the wavy seams from here. I have the same feeling about knits – I feel like i’ve tried every tip but not found a magic solution for producing something that doesn’t irritate me too much! No worries – it’ll be the perfect length in about a month at the rate kids grow! 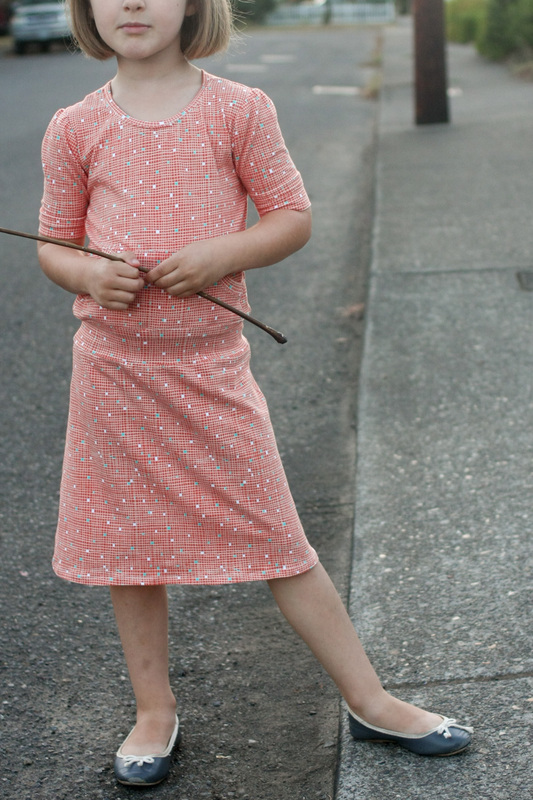 I love knit dresses for kids and this one has such great little details. 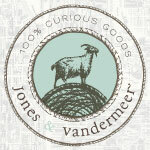 And I’m super excited about more high quality knits hitting the market. It’s about time! Very grown up, very stylish. Just lovely Gail. That is a perfect dress! I think I will just have to buy the pattern, and maybe get some of that art gallery knit. Beautifully done! Her little arms and shoulders look so cute in this! Adorable! I was looking for inspiration for this dress and found your review. 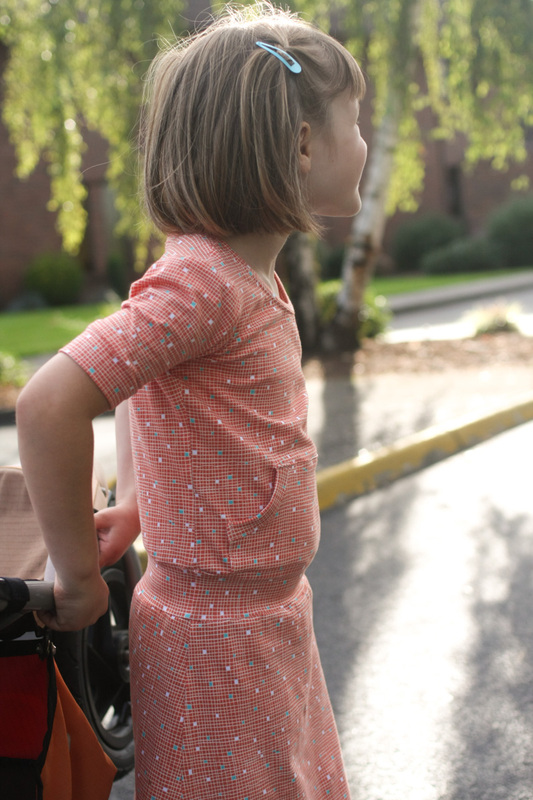 So, you may have worked this out by now – but I have yet another tip for hemming knits. I use E-Z Steam-a-Seam Lite II to “tape” up all my seams on knits before hemming them. I use a coverstitch machine, but it works equally well with a double needle on a regular machine. Just be careful to use a 1-1 ratio tape to fabric (don’t stretch the fabric), and the stuff is amazing. My hems always look fab now. As for the neckline, I never use the pattern pieces included. I always kind of pin them on as I think they should be, then sew the loop and baste it on first to be sure it’s the right length. I make adjustments as necessary, then serge!